One of the finest glass companies in the world was the Vianne Glass Company of France, founded in 1928. They were among the biggest glass companies in France. Located near Bordeaux in southwest France, Vianne was the last surviving glass maker in France to produce hand blown glass. All of the companies that bought glass from Vianne proudly announced they used their glass. At the end of December 2005, this respected company closed its doors. Many lighting companies bought up the remaining stock of Vianne glass shades, all advertising that when they’re gone, there will be no more. 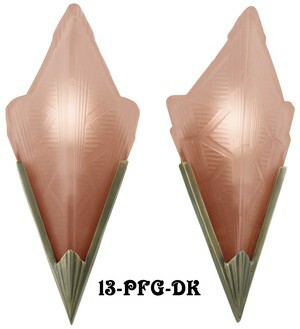 Vianne made many styles of glass shades, but the early Art Deco slip shades are highly rare and valued. All slip shades are probably well over 60 years old, since the Art Deco era ended with World War II. Here is a delightful combination of old and recreation. While we have been slowly accumulating old French shades by Vianne for some time, the frames to hold them are darn hard to find. We decided to solve this problem by duplicating an original frame and adding a few touches to make it UL compliant. French manufacturers did not really do that. 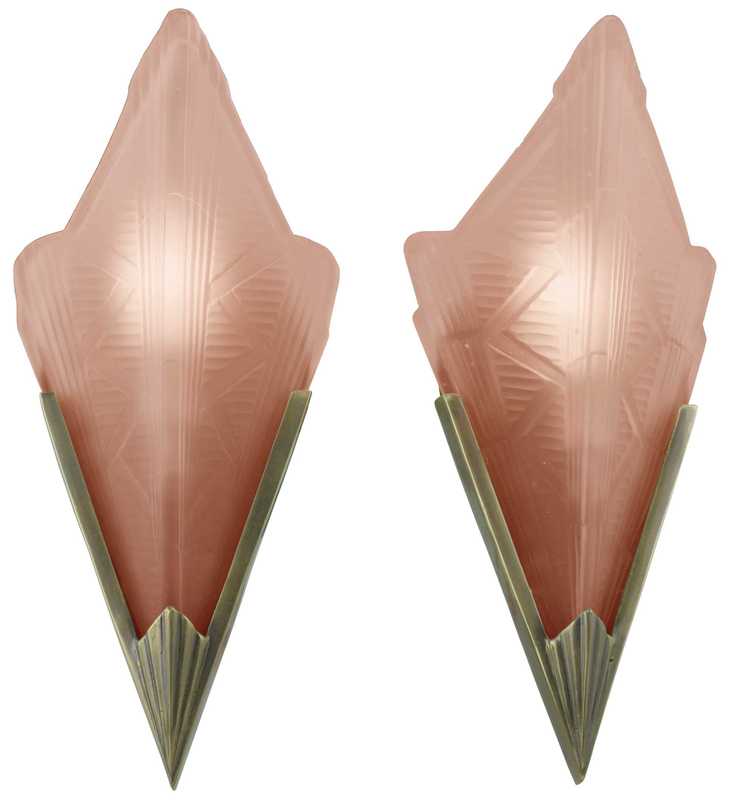 Sconces are sold in pairs, and are priced as a pair. In the "quantity" to order, "one" equals one pair. Each sconce is wired with a porcelain candelabrum socket by Leviton and is rated for 100 watts or more. 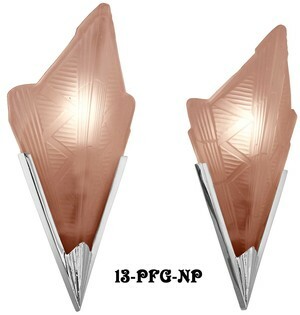 It is possible to wire these with a socket that would take an LED bulb if so desired. No switch is available on this French design. Overall Measurements (with shade): 12 1/2" height x 6" width. Projects from the wall 4 1/2". Frame Measurements: 9 1/2" height x 4 3/4" width. Backplate of the Frame Measurements: 6 1/4" high x 4 11/16" wide. The 3/8" diameter mounting hole is centrally located at 3 13/16" from the bottom of the backplate. The socket can handle up to a 100 watt incandescent bulb, or purchase our optional LED candelabra bulb, using only 2 watts and putting out about 25 watts of incandescent equivalent light. 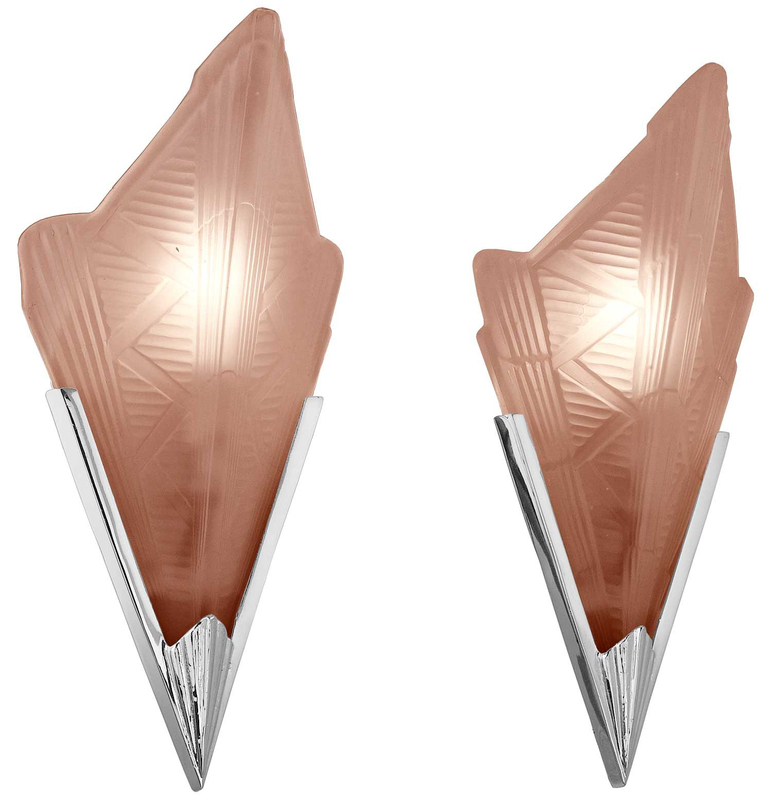 Makes running the sconces all night long, perhaps as a nite lite, very economical indeed and cool to the antique shade as well.